I start my day with a hot cup of Peet’s. Every day. I sip on freshly squeezed lemonade with my kids on the warm summer afternoons. Or bubbly Pellegrino. I drink red wine (the bolder variety) at dinner on non-gym nights, or with friends on weekends. Sometimes on gym nights as well. And cozy up in front of my favorite show when the house goes quiet at night, with a glass of strawberries in minted honey syrup. This syrup is pretty addicting but what is more addicting are the strawberries. Refreshing, mildly sweet, and slightly minty, they taste like a dessert (with none of that guilty feeling). I usually drink the beverage as-is but sometimes I dilute it with a splash of bubbly water. Bring the water to a simmer in a saucepan over medium heat. Pour in the honey and whisk it into the water until it dissolves fully. Continue simmering over medium heat for 5 minutes. Remove the pan from the heat and let the syrup cool to room temperature. You do not want to “cook” the strawberries in hot syrup. Hull the strawberries, cut them in half, and set them in a bowl. Pluck the leaves off the stems of mint, tear them with your hands and drop them into the bowl with the strawberries. 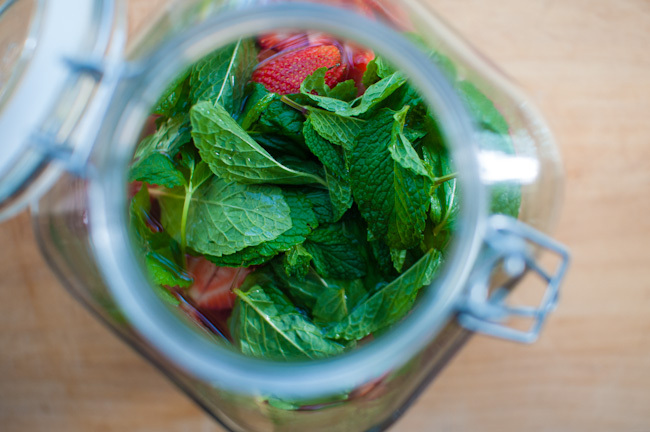 Pour the cooled honey syrup over the strawberries and mint, then cover with bowl and transfer it t the fridge. Allow the berries to marinate for a day, and then serve them with their syrup.